Our community/nation/world is facing a mounting immigration problem. 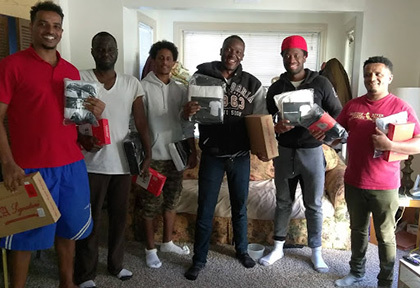 Locally, AIDNW offers emotional support to the 1500 immigrants detained in Tacoma and a warm welcome and transitional support when they are released. Our monthly operation costs are over $10,000 and we rely heavily on individual contributions. We need YOUR help to show immigrants that we care! 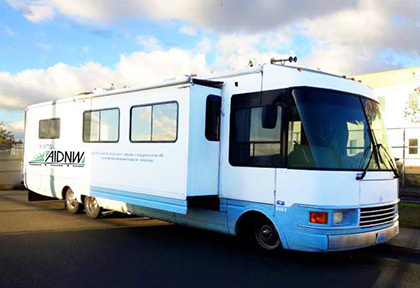 A fund-raising campaign is underway to provide a new or slightly used (under 10 years) 32 – 36 foot “Class A” RV, to replace the current Welcome Center RV, which is 20 years old and on its last legs/axles. for showing that you care! Men’s warm and waterproof jackets, hats and gloves. These need to be clean and in good condition. Used jackets are fine but they need to be something that a young person would feel good wearing. Most of those released are slender, so medium sizes are preferred. We have volunteers scheduled to take non-cash donations that can be brought to the AIDNW office, located at 1915 S. Sheridan Ave. in Tacoma between 11:00 am – 3:00 pm, Tuesdays and Thursdays (only those days please). Non-cash donations for all programs can be brought to the AIDNW office located at 1915 S. Sheridan Ave. in Tacoma between 11:00 am – 3:00 pm, 11-3 Tuesdays and Thursdays (only those days please). Laptop computers for speaker presentations so we can share what we do and who we are. You can now link your Fred Meyer rewards card to support AIDNW. Link your card by logging into your Fred Meyer account (or creating an account), then enter “community rewards” in the search box. Or you may click on button below . Under “find (or change) an organization”, type in our full name: “Advocates for Immigrants in Detention NW” to link your card. Many of these items–and more–can be found on our Amazon Wish List. We will receive extra benefit if you start your purchases at Amazon Smile. Under the Amazon Smile program you can set your account to donate to AIDNW (using our full name: Advocates for Immigrants in Detention Northwest), at no extra cost to you.